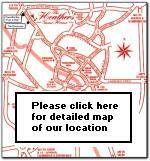 The Heathers is well located - from which ever direction you approach York. Use the A1237 Ring Road north of York to avoid the town centre traffic and find us situated between the A1237 and the city centre - on the A19 York to Thirsk road. From the A1, take the A64 towards York and then the A1237 Northern Ring Road. At the junction with the A19 turn right towards the City Centre. The Heathers is 1 mile down on the left, shorty after passing the Clifton Park Estate on the right. York City centre is approximately 1 mile away, the A19 has two large car parks just outside the City Walls for those visiting the city centre (which is largely pedestrianised). Alternatively we may allow guests to leave their car in our car park and take a taxi or bus to the centre. Buses run approximately every ten minutes up to 20.00 hrs from a stop about 300 yards from our entrance. ...and despite the above we still have our rooms at the front overlooking pasture-land and cricket/rugby pitches in the distance; whilst "quieter" rooms at the back over look a large private garden. we request NO SMOKING whilst inside the house.